Formerly a deserted Japanese (?) Steak (??) House (???) along a more upscale area of Strip-Club Row, the massive missive that is Seafood Island, 4700 W. Reno Ave., is an extravagant piece of Las Vegas-in-a landmass floating among the trash vortices that line the busy street. Driving by there a few times a week on the way to and from the Indian Clinic, I have become so intrigued by the usually-empty parking lot and the row of 30% off signs that I decided to dock my trace-amounts of hunger there for a quietly-festive birthday lunch last week. Land…ho? 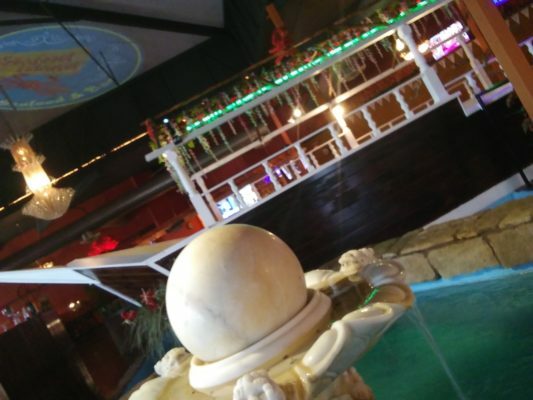 Once one walks past the intimidating horse statues that keep quiet sentry over the property of the Island, inside you’re immediately greeted by a caustic life-size pirate ship and a moderate fountain with one of those monstrous spinning marble spheres in it as the restaurant’s illuminated logo maintains a steady-pace on the vertigo-inducing high ceilings. It’s a moving tribute to Poseidon, Aquaman and the hard-working pirates who stalk the Somali waters, all at the same time. Seated at my table, the overhead lamp projected a bright, dazzling light into an otherwise mostly-darkened eatery; I thumbed clumsily through the deliciously basic menu and was unusually taken aback by the interesting mix of mouth-moistening seafood for such a brutally land-locked restaurant. From the usual fare of fried baskets featuring calamari and catfish to the more sophisticated swag of blue crab and manila clams, if you’re a seafood lover, they’ve definitely got a Sea World tank full of tasty variety. As far as edible mollusks go, in the past few years I’ve, of course, feasted on the omnipresent mussels at various Chinese buffets and, once, even enjoyed a buttery and bacony helping of a gorgeous plate of clams casino in Baltimore. Sadly, however, that’s the grand extent of my rackin’ and crackin’ knowledge; but, with the menu practically dripping with sand-crawlers and mud-trawlers of all sorts, it was definitely time to shuck and awe once more. 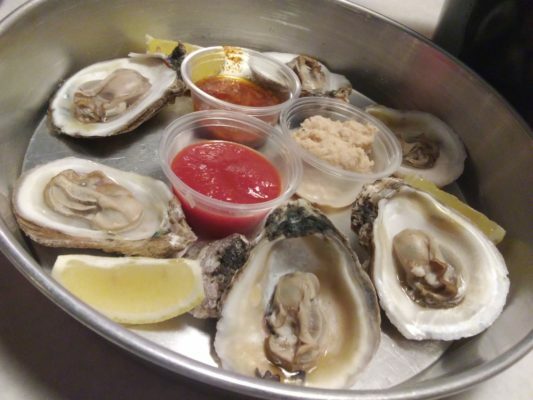 While admittedly an absolute waste of their total aphrodisiac powers, I requested a half-order of Steamed Oysters on the Half-Shell ($10.00) for a very lean, very pert appetizer complete with cocktail sauce, horseradish and a provocative Asian-inspired dipper. Shells open and exposed to the world, the oysters were delectably chewy with a sangreous taste not unlike that of a blood-infused gummy-bear. You either like that or you don’t. I tend to love it, so the steamed oysters were a true land-lubbing hit, matey. Roughly tearing off the thin skin and multiple legs, biting into that plump shrimp was an oceanic taste sensation with the slightly-burning powder gelling nicely with the sweet bottom-feeder meat. Call me crazy from drinking salt-water on my own time, but I’m actually beginning to think boiled shrimps might even be better than fried. Regardless of style, the shrimps were hella-plentiful and heavenly delicious, with the rotund assortment of goodies in my grab-bag quite a great pairing with those headless beauties, hard-boiled egg mercifully included. Oh, how right you were you dirty little crab…how right you were. Cómpralo ya! Bit of trivia: After it’s life as a Japanese steakhouse, this building played host to an Italian restaurant called Portofino’s for about 8 years. I used to work nearby, and while the food at Portofino’s wasn’t outstanding, it was still pretty darn good. I ate there a few times a month until I got a better job elsewhere in the Metro. I’m kinda sad Portofino’s is gone, their lasagna and manacotti were both great! That said, if I find myself in the area, I’ll definitely have to check out the new menu… Sounds like the change to seafood might be a pretty big hit! So good to see a Louis food review! Hey, you can eat healthy and still have great meals! Just learn to put down the feed bag, easier said than done. I work near this place and I have been curious about it. I might try it out soon. Thanks for the review. Louis glad to see you getting your gusto back. You were missed. Your reviews since you returned get better and better. Hopefully because you’re feeling better and better! That sounds like a made up name if I ever heard one! LMAO Be sure and vote Todd Russ out of office in November! Interesting. 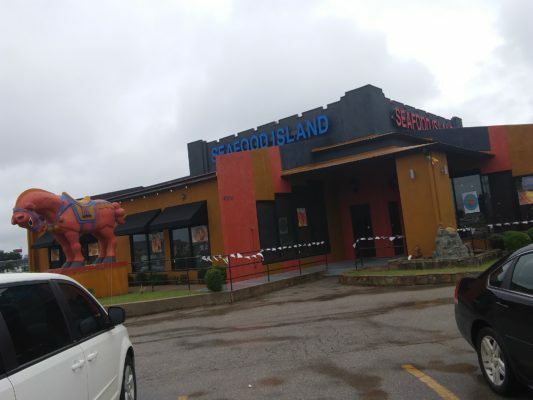 This past Sunday we went to the new Lakeside Seafood on NW expressway, and had checked out the menu of Pier 88 on I-240 after passing it en route to Norman on Saturday. Those two plus your horse-bedecked place all sound exactly the same. Boils and baskets, Asian inspired but really just cooked seafood. The menus of each I thought were limited, as “seafood” in the name made me crave broiled or grilled fish options. Instead we got fried shrimp and fish straight from the Schwann’s truck. I’ll be interested to see just how many of these same places open up soon. Kind of creepy, actually. Glad you liked it, you’re the expert! I have a confession… I just take off the little legs and eat the shrimp in the shell. It’s perfectly safe to do and it tastes better. Why else would they cook it fully shelled in spices? When you get all the shell off you lose all of the flavor. Thanks for the funny review. Pier 88 is conditionally really pretty good, conditional in that the food is well prepared, prices fair, (great on the fried platters) however I’m sure due to complaining customers, it is not very spicy for Cajun food, BUT they all the spice in bottles you can add to your preferred level. Fried fish/shrimp is fantastic and priced great. 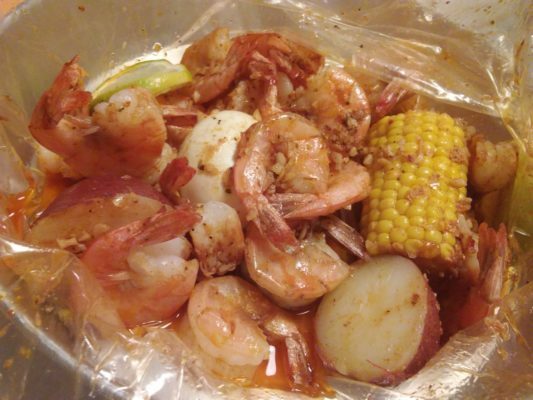 The Crawfish pot just across the street is more Cajun related and similar but their food does have the spice. 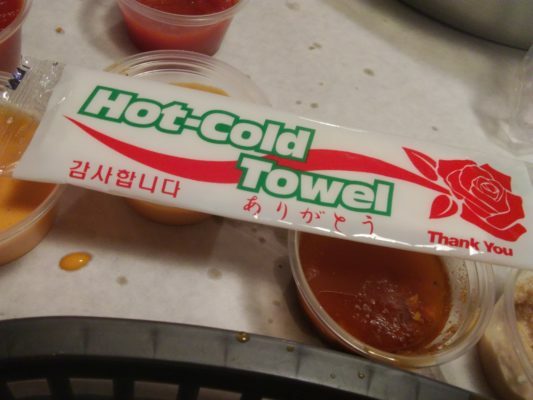 Both places are very good in my opinion. Based upon your reviews I’m certain you will find both places approvable, both in food quality, quantity and price.